After watching “The Devil Wears Prada” for the millionth time, I think about how the main character, Andy, switches her wardrobe from drab to fab in a matter of seconds. The fact that someone can reinvent themselves through clothing is fascinating. It made me think about how I can freshen up my wardrobe without always having to renew my entire closet. Fashion is a bittersweet topic right now because I love to shop, but I have low funds. I think this is the case for plenty of college students. Since I have to stretch my dollar, I decided to learn the art of fashion research. With my research, I have found that creating a “capsule wardrobe” is a way to save money in the long run. A capsule wardrobe is a compact wardrobe that is full of pieces that will never go out of style and always complement one another. In the 1970’s, Susie Faux owner of a fashion boutique in London created the term “capsule wardrobe,” which is usually comprised of around 30 to 40 staple pieces and some extra seasonal pieces. Not only does this help save money, but it allows for less contemplation over which outfits to wear and makes for less clutter. It helps make sure my closet is full of quality pieces and less miscellaneous clothing that I would never wear. 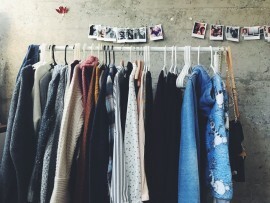 The first step to creating the perfect capsule wardrobe is to figure out what style of clothing to buy. Different styles to choose from could be vintage, boho, sporty, artsy, glam, classic, preppy, or punk. I always tend to sway towards a boho-chic style, which is a style based from elements of bohemian and hippie fashion. For me, boho-chic gives me a chance to wear a wispy floral blouse with leather pants and a silver chain choker. After deciding which style to focus on, it’s time to figure out what color scheme to use. Neutrals are the way to go for a capsule wardrobe because the layered pieces will add texture and a pop of color. I used this rule for my clothing and accessories, but not on my shoes. I let myself have around 6 pair of shoes because I’m a shoe person and it is very hard for me to part from my shoes. First, go through all clothing and weed out all the items that are not absolutely a favorite. Remember to try to stick to the “3 of each rule” and a neutral color palette for the core clothing items. Make sure to keep 3 good and versatile t-shirts, blouses, pants, jeans, skirts, dresses, cardigans, and jackets. After the sorting is over (the hard part), take all the good quality clothing that is not needed and give it to a charity or a thrift store. Second, make a plan for style, color palette, textures and prints. This gives the opportunity to customize and give more depth to your new wardrobe. Try out a new color palettes like subtle blushes or hues of blues. Decide on whether to use floral prints, geometric prints, or animal prints. The last and best step is to go shopping. The goal for shopping is to save as much money as possible, so do not stick to one source of shopping. When shopping, I usually start at thrift stores because it is a great way to save money and find neat clothes. Then, I look online for great deals at shein.com, zaful.com, and lolashouetique.com. After checking thrift stores and online shopping, I will go to the mall and outlet malls and shop all things clearance. 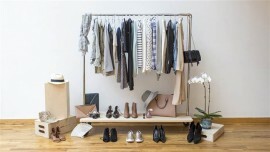 Creating a capsule wardrobe is a way to let go of all the clutter, and to start a new canvas of fashion.